The primary MAST search page now includes the option search for scanned HST data. 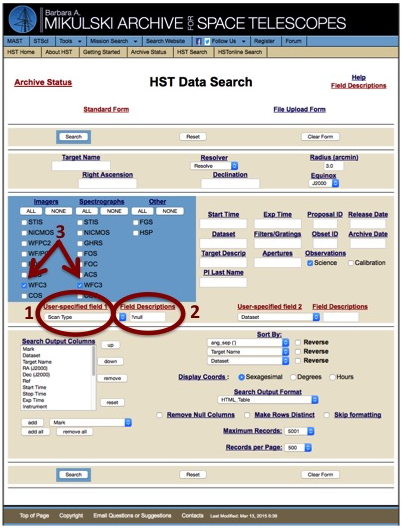 The primary MAST HST search page (http://archive.stsci.edu/hst/search.php) now includes the means for finding, or excluding, scan data taken with any HST instrument. The update also includes "Scan Type" as a default output column on the HST Search Results page. Select "Scan Type" from either the "User-specified field 1" or the “User-specified field 2" pull-down menu. Set "Field Description" to "!\null" in order to locate only scanned data. Adjust any other desired qualifiers. In the example shown, we restrict the search to WFC3 data only. Then select "Search". Figure 2 illustrates the output from a sample search for any scanned WFC3 data. The output has been sorted in time-order, showing the oldest images at the top, by clicking on the “Start Time” column heading. Note the new "Scan Type" column; all WFC3 and other current instrument scans will be of type “C” (continuous) only. Earlier instruments such as FOC, FOS, WFPC2, etc. took both “C” and “D" (dwell) type scans; the D scan is no longer available as an observing option. Normal staring mode images will have a blank "Scan Type". To exclude scans from the MAST search and locate only staring mode observations, set the "Field Description" to "\null". Figure 2: Example output for a sample search for scanned WFC3 data. Any questions regarding accessing scanned HST data from the MAST archive can be sent to archive@stsci.edu. The latest HSLA release includes additional raw and coadded spectra, as well as the latest updates to the COS/FUV and COS/NUV reference files. With no future space ultraviolet instruments currently planned, the data from the UV spectrographs aboard the Hubble Space Telescope have a legacy value beyond their initial science goals. Since Cycle 24, the astronomical community has been offered a novel way of mining the Hubble data archive through the Hubble Spectroscopic Legacy Archive (HSLA). This archive provides quicklook spectra for raw COS/FUV, coadded COS/FUV spectra and raw COS/NUV data, as well as tools for measuring signal-to-noise and flux variability. We announce the second release of the HSLA. In this release, all public raw COS/FUV spectra, all COS/FUV coadded spectra, and all raw COS/NUV spectra accessible through the HSLA are using the latest updates to the COS/FUV and COS/NUV reference files. The HSLA contents are also augmented with all COS datasets that entered the public domain since March 2016. The HSLA products are available on MAST at: https://archive.stsci.edu/hst/spectral_legacy/ together with a description of their contents. Questions about the content of the HSLA can be sent to hst_spec_legacy@stsci.edu. MAST is now hosting a new collection of detrended K2 light curves from Campaigns 1-6, including catalogs of exoplanet and eclipsing binary candidates. POLAR (Barros et al. 2016) is a set of detrended light curves from K2 Campaigns 1-6. The team makes use of a pipeline to reduce target pixel files, including optimized apertures and decorrelations of systematic noise dominated by the frequent thruster firings of the spacecraft to maintain pointing. The pipeline is optimized for bright stars, and achieves a maximum precision of six ppm over six hours. In addition, the team uses their detrended light curves to search for exoplanets and eclipsing binaries. The team has provided the detrended light curves, catalogs of exoplanets and eclipsing binaries, and summary plots containing statistics on the detected objects. Please see the MAST POLAR page at https://archive.stsci.edu/prepds/polar/ for additional details and data access. Questions about the MAST archive of the POLAR data can be sent to archive@stsci.edu or posted on the MAST Forum. A multi-wavelength collection of new and archival observations of 20 nearby starburst and post-starburst dwarf galaxies is now available from MAST. 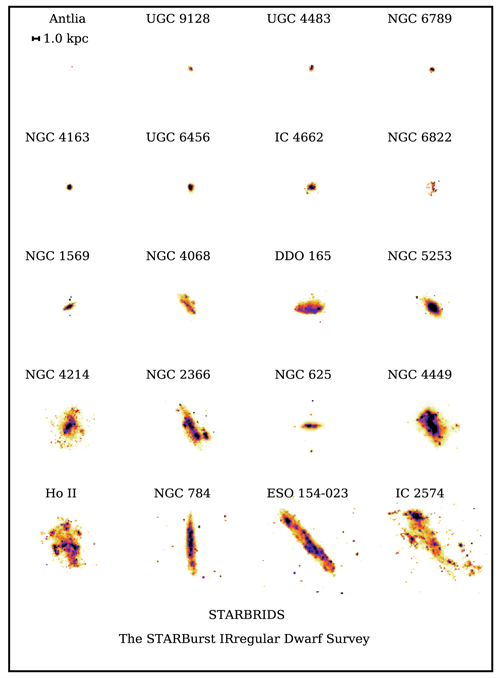 GALEX NUV images of the STARBIRDS galaxies resampled to the same physical scale (McQuinn et al. 2015). The STARBurst IRregular Dwarf Survey (STARBIRDS; PI: Kristen McQuinn) is a collection of new and archival observations for twenty nearby (d < 6 Mpc) starburst and post-starburst dwarf galaxies. The first public release includes flux-calibrated and background-subtracted images – all registered to a common world coordinate system -- from GALEX (FUV and NUV), HST (V and I), and Spitzer (MIPS). In addition, three complementary sets of images are available: (1) a set of GALEX and Spitzer images cropped to match the field-of-view of HST; (2) HST images convolved and rebinned to match GALEX and Spitzer resolutions; and (3) GALEX images with a field-of-view extending significantly beyond optical diameter observed with HST. Future updates to the archive include additional data from Chandra, Spitzer IRAC, ground-based H-alpha, and Green Bank Telescope neutral hydrogen imaging. The sample selection and primary science aims of the STARBIRDS project are described in McQuinn et al. (2015). Please see the MAST STARBIRDS page at https://archive.stsci.edu/prepds/starbirds/ to download the data and for additional details. Questions about the MAST archive of the STARBIRDS data can be sent to archive@stsci.edu or posted on the MAST Forum.